I went to the College of William and Mary and studied Paintings Conservation at the NYU Institute of Fine Arts Conservation Center. Later I earned a PhD in Art History to help with my work administering the first doctoral program in North America in Art Conservation Research at the University of Delaware. I work with the Wyeth family of artists and Andrew Wyeth painted my portrait in 1999. I've also continued my involvement with musical theatre as Susan Barker predicted in the Rollingwood Class Prophecy ca. 1959. I had an Off-Broadway show in 1974-5 which was called the "best mini-musical in town" by the New York Times, + 3 Off-Off Broadway shows at small theatres and cabarets, 2 works commissioned by the Delaware Humanities Forum on the Underground Railroad and Woman's Suffrage in Delaware. I loved B-CC-- the people I met there, and my work in theatre with P. J. Dalla Santa and Rusty Thacker (who unfortunately died of cancer in 2012), and in art with Mr. Motovich. I'm happy to have kept up with many of my classmates and look forward to seeing even more of them in 2014. Joyce Hill Stoner has a birthday today. 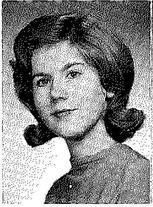 Joyce Hill Stoner updated profile. View. Joyce Hill Stoner has left an In Memory comment for Gale Garvin. I remember Gale mostly from Rollingwood Elementary School. He was quiet and very nice, and had the world's longest, thickest, and most beautiful eyelashes! Joyce Hill Stoner has left an In Memory comment for Giudo Ajmone-Marsan. Rusty and I always talked about Guido and all the wonderful things we thought he would end up doing! He certainly did do wonderful things, and I wish Rusty were still here to join me in reading this! Joyce Hill Stoner has left an In Memory comment for Rusty Thacker. Rusty Thacker and Bernadette Peters were two of the actors listed in the May 30, 1968 New York Times report of Theatre World’s award for “most promising actors.” Thacker starred in the pop-rock musical Your Own Thing (based on Shakespeare’s Twelfth Night) in 1968. Walter Kerr noted: “Rusty Thacker (a real find) sings with a blend of show-biz vibrato and on-the-level simplicity that pulls a couple of worlds together quite effortlessly.” Clive Barnes reviewed the show twice, noting: “Rusty Thacker, grinning as if he had just discovered the world, is equally as charming [as Leland Palmer].” Thacker then went on to star in a record number of Broadway shows in the 1970s and ‘80s that closed in a week or less: Heathen, Dear Oscar, Home Sweet Homer (with Yul Brynner as Odysseus), The Grass Harp (with Barbara Cook), Do Patent Leather Shoes Really Reflect Up, and Me Jack, You Jill. Several of these are available as cast recordings. In 1983 and ‘84, Thacker and Allen Hill devised and performed a cabaret review Olio, mentioning these short runs; and John Wilson of the NYT noted “he has made the best of this tribulation by using it as the basis for one of the numbers.” Wilson also noted Thacker’s many skills: “He sings while juggling a glass ball in a way that brings the ball alive. He plays the guitar and the concertina. He gets dressed and undressed and crawls in and out of a trunk, and in the midst of all this he manages to show off his strong, vibrant tenor voice with great effect.” (NYT Sept. 18 1983). Thacker (book and lyrics) and Bert Draesel (music) wrote several musical theatre works that were performed in cabarets and workshops: Bouncing Back, Everyman, Gallery, and Step into the Light. Thacker toured as Barnum, George M, Pippin, and Will Rogers, and over his career also starred alongside Gene Kelly, Vincent Price, Georgia Engel, Priscilla Lopez, Judith Ivey, Debbie Boone, Sandy Duncan, Shirley Booth, Donna McKechnie, and many other theatre luminaries. Thacker played a long-running character in Love is a Many Splendored Thing (1967) and had to be written out of the show (his character “went to Canada to avoid the draft”) in order to appear in live theatre in NYC. He said it was a challenge to act in a soap opera—his father had been murdered and he hadn’t seen the future scripts to know whether he had done it or not! He also appeared in Goodtime Girls and FBI on television in the 1960s and in the movies: Parades, Savages, and A.W.O.L in the 1970s. Playing a character that has a stroke, Thacker ironically had a stroke onstage; this was the beginning of a number of health crises that ended in his death from cancer on December 7, 2012. He is survived by his partner of 18 years, John Olund, a singer in NYC; Jeffrey Thacker of Ft. Lauderdale, FL, and Billie Saunders of Silver Spring, Maryland. His B-CC classmates have set up a fund in Thacker’s name to help projects in the Drama Department: online at www.bccedfoundation.org or send a check payable to the B-CC HS Educational Foundation, at P.O. Box 31209, Bethesda, MD 20824-1209. Whether donating online or by check, donors should be sure to note that the contribution is in memory of Rusty Thacker, for the B-CC Drama Dept. The above is an obit I wrote for the WaPo and the NYT and neither would publish because he hadn't spent enough of his life in DC or was no longer "famous enough." He did all these wonderful things, but in the end was known for being in a record number of short-lived shows, and that put a shadow across his gettig cast in things. I think this really bothered him. Rusty was one of my best friends from 1957 when we met behind "Doc's" drug store on Brookville Road until his death in 2012. In the summers, the Bethespians put on SEVENTEEN (1961); FORTY FIVE MINUTES FROM BROADWAY (1962); FINIAN'S RAINBOW (1963); and BABES IN ARMS (1964). He also directed some shows for talent nights at B-CC; I remember one event for which he simply told about 24 girls to make themselves costumes-- blouses and skirts white on the front and black on the back (amazingly they just all DID this) and he put fluorescent paint designs on the white side-- then they backed out in a line and turned around one-by-one in UV lighting-- I think Cathy Ikenberry was one of the group. It was a remarkable effect. Then I went to William and Mary and he went to Broadway. But we kept up, and many of us went backstage to see him in Odyssey, Your Own Thing, Earnest in Love, etc. I think he attended only one reunion-- the 20th in 1984. He said he didn't feel up to coming when he couldn't say that he was doing something really fantastic, which is sad because we all loved seeing him and remembering him in West Side Story and so many other shows. I am very sad that he will not be with us for the 50th. Joyce Hill Stoner has left an In Memory comment for Robert Hoage. heartbreaking to look at-- when his lovely red-haired wife died he said "a light had gone out in the universe." "Happy Birthday sweet Uncle R.J. Wish I could hug you!!!" What an odd thing Facebook is...it can be a lovely memorial site. Joyce Hill Stoner posted a message. Thanks for signing up on the website! 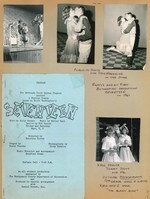 Was just looking at our pictures dancing at 6th-grade graduation-- wow-- was that 55 years ago?? And I remember you were the reporter or talent scout (?) connecting together one of Rusty's and my shows at Leland--it's but a fun SIX decades!!! Joyce Hill Stoner added a comment on Profile. Joyce Hill Stoner posted a message on Giudo Ajmone-Marsan's Profile. Joyce Hill Stoner changed profile picture. Our family New Year's card of 2012. Rusty Thacker and me in SEVENTEEN-- a "Bethespians" production in 1961. 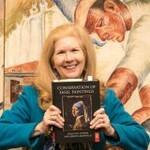 With my 2012 book on the conservation treatment of paintings-- 890 pages and 79 international authors. Excerpts from an 18th century style musical about artist Charles Willson Peale wooing his second wife, Betsy. Loosely based on "She Stoops To Conquer."